An employee of Aardvark Clay & Supplies, Inc., was fatally entangled in a clay manufacturing machine called a pug mill. The employer removed safety guards from the industrial mixer, according to Cal/OSHA, and the worker had not received training on the machine before the accident. Aardvark Clay & Supplies uses industrial pug mills to manufacture and mix clay. During Cal/OSHA’s investigation following the worker’s death, the agency found that all four of the shop’s pug mills had unguarded openings exposing employees to the moving parts. California’s occupational safety and health standards require all mixers to have a cover to prevent employees’ hands from entering the machine during operation. An employee became caught in the unguarded mixing blades of a pug mill September 20, 2018, when he tried to identify why clay had stopped traveling through the extruder. “Pug mills have rotating blades that can cause amputations and fatally injure employees,” Cal/OSHA Chief Juliann Sum said in a statement. “Employers must ensure all machinery and its parts are properly guarded, and employees are effectively trained to prevent tragic accidents like this,” Sum said. Serious violations for hazards from the unguarded cutting portion of the clay machine and failure of the employer’s safety program to identify unsafe conditions, implement corrective procedures, and effectively train employees on work-related hazards. Serious violations are cited when there is a realistic possibility that death or serious harm could result from the hazard created by the violation. Equipment and machines used in many industries—including agriculture, construction, and manufacturing—can be hazardous. Contact with equipment or machinery can result in crushed limbs or extremities, cuts, amputations, and even death. Contact with objects or equipment was among the leading causes of fatal occupational injuries in California from 2013 to 2017. 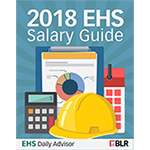 It was the fourth leading cause of on-the-job fatalities in 2017 after transportation incidents; slips, trips, and falls; and workplace violence. While the operating controls, point of operation, and power transmission device are common to all equipment and machinery, the appropriate guarding can vary significantly. Guards can be adjustable, fixed, interlocked, or self-adjusting, depending on the hazards present and how the machine operates. To learn more about Cal/OSHA enforcement trends and strategies to stay in compliance, attend BLR’s upcoming Cal/OSHA Summit 2019. 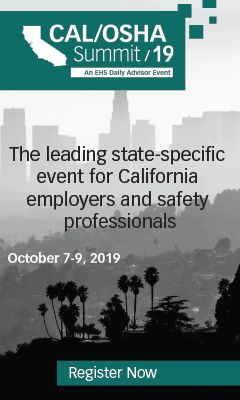 The Cal/OSHA Summit, which will be held from October 7–9 in Los Angeles, is a leading state-specific event for California employers and safety professionals to get cutting-edge developments on new safety regulations, compliance strategies, and management tactics. Register now.